Nursing Archives seeks to collect and preserve material that relates to and provides evidence for the education of nurses, nursing practice, the careers of Alfred nurses, their contribution to the community, the changing dynamics of the provision of health care on the development of nursing and the preparation of nurses at the Alfred Hospital since 1870.The types of items are record books of nurses training from 1880 ,photos, written and recorded memories, letters, pamphlets,speeches, invitations, nurse work books, diaries uniforms, medals both hospital and war and hospital equipment. The Alfred Hospital Nurses League Nursing Archives is significant as it holds evidence of the high standard of nurse training since 1880. Evidence of nurse practice and changes over the decades in the hospital and the community. A source of information on social and cultural roles of women, their work and health care environments. The collection can offer research on the many themes we have identified. 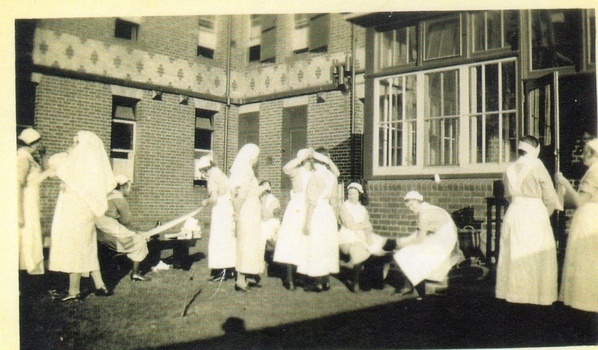 War nurses, prominent Alfred nurses, costumes, environments, nursing history and key clinical areas in the hospital. I have no connection with the nursing profession, except as a patient but I found this collection fascinating. This is a rare photo of the operating theatre circa 1907 at the Alfred Hospital. Sister Gertrude Lawson graduated 1887, is pictured in the operating theatre circa 1907 but she probably did not play an active role. At this time the surgeons were assisted by a male attendant. In 1899 Matron Laura Pratt wrote, " There were 3 main operating days, the surgeons being Mr Henry O'Hara, Mr Cook and Mr Buchanan. There was one theatre sister whose duties were to prepare the theatre and attend all operations, buy and keep instruments in repair, prepare all types of sutures. She was on duty 24 hours for emergencies with a trained deputy on call from the ward in her absence. 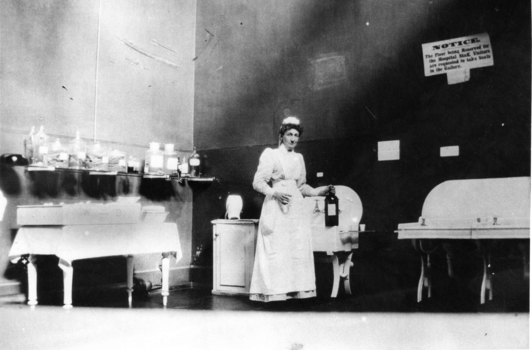 This system was altered about 1909 when each nurse at the end of her second year was given a month in the theatre"
A rare photo of the Alfred Hospital operating theatre circa 1907. No antiseptic measures were taken in surgical work apart for instruments being boiled in water and soda. Rubber gloves were not introduced until 1908. The notice on the wall reads: "The floor being reserved for the hospital staff. Visitors are requested to take seats in the gallery." A small, engraved silver bell. A double rim around the base and leaf shaped handle with spaces of different shapes carved along the length of the handle. 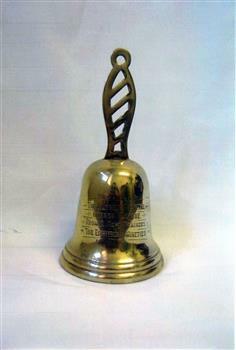 A few of the nurses who trained in the 1880's and 1890's presented this bell, on 3rd August 1931, to the Alfred Hospital Nurses League. 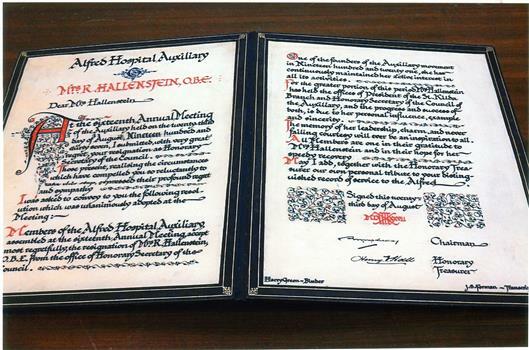 The Nurses League was founded in 1918 and the bell was presented with a note, 'hoping it will be useful and also to show warm appreciation of our very pleasant Reunions' from a few of the Trainees of the Eighties and Nineties. Presented to the Alfred Hospital Nurses League from a Few Traineees of the Eighties and Nineties. The sterilizer is made of stainless steel and constructed like a fish kettle with a perforated tray on which instruments and syringes were placed. Hot water is heated to boiling point either by gas or by methylated spirit burners. Louis Pasteur, a French scientist in 1863, identified that microscopic living creatures caused fermentation and putrefaction.Following this he boiled the fermenting substances which killed the microbes development. Robert Koch, a German doctor proved conclusively in his experiments that the living creatures that he called bacteria caused infections. He demonstrated that live steam was superior to chemicals in killing bacteria. Curt Schimmelbusch, a German scientist and Felix Terrier a French scientist, almost simultaneously created the practice of steam sterilization which became the standard for sterilization in Operating Theatres world wide. Wound infection was a major cause of death following surgery. The discovery of steam as a method of killing microorganisms led to the development of sterilizers. The steam sterilization of instruments, syringes and the use of chemicals for some objects used in surgery helped reduce the infection rate. 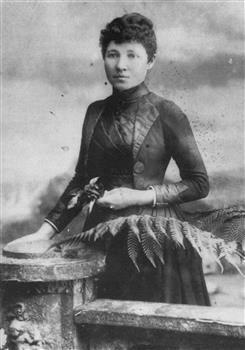 A black and white photograph, showing nurse Maria Birrell circa 1882 dressed in her civilian clothes. 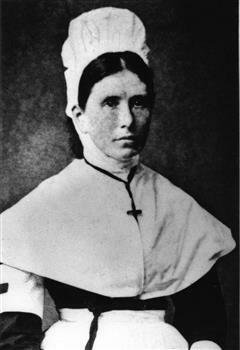 Nurse Maria Birrell was one of the first nurses to graduate from the Alfred Hospital nurse training school in 1882. The first school commenced 1st December 1880. The Alfred Hospital nurse training school was established and commenced 1st December 1880 and there are very few photographs of the early student nurses. A plaster of paris staturette of Dame Edith Evans who portrayed Florence Nightingale in the film 'The Lady with the lamp' in 1929. 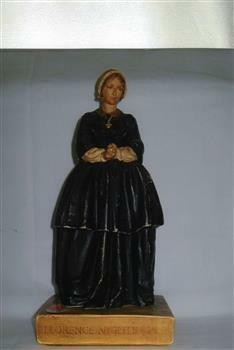 The figure is clothed in full length black dress, a cross around her neck and a cap on her head. Hands clasped at the waist. The film 'The lady with the lamp' 1929 was portrayed by Dame Edith Evans. This was made in the image of Dame Evans. This statue is a representation of Florence Nightingale and is a reminder to nurses that Miss Nightingale was a remarkable women and founder of the Nightingale Training School in London and established nurse training in Australia. Haldane Turriff was the first Matron of the Alfred Hospital from 1871-1880. She was one of five nurses selected by Florence Nightingale to be sent out to Sydney with Lucy Osburn in 1868. She was one of two nurses selected by Lucy Osburn to nurse Prince Alfred , Duke of Edinburgh following a failed assassination attempt that occurred in March 1868. Haldane Turriff , as the first Matron of the Alfred Hospital, was the link between the Nightingale School at St Thomas Hospital, London and the Alfred Hospital. Although she did not establish a training school at the Alfred Hospital in the Nightingale tradition, she laid the foundation for an excellent standard of nursing that has continued today. On the reverse side of the photograph there is printed the name and address of the photography gallery ie London portrait gallery, 19 Royal Arcade, near the fountain, Melbourne. The inscription[ in handwriting] states 'Miss Turiff [sic] Turriff, matron Alfred Hospital nursed Duke of Edinburgh after attempted assassination. A newspaper photograph and a short article congratulating the nurses who have recently graduated in nursing during a power black out. This is a photo of some nurses who graduated in 1962. 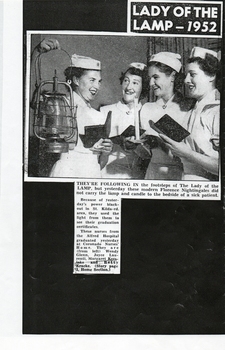 It became a story for the newspapers as the nurses needed to view their certificates by using a lamp during a power blackout in the St Kilda Road area. The article describes the nurses graduation which was held during a power blackout. They required the use of a lamp to see their graduation certificates. 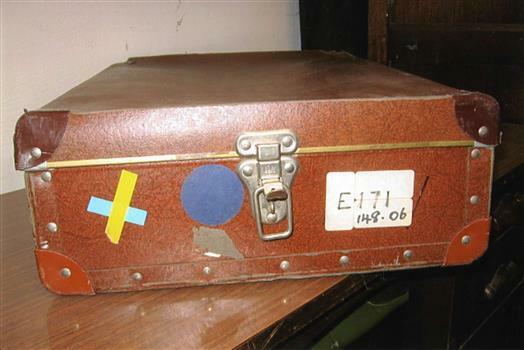 This brown, pressed cardboard laundry case, no handle, and catches at both ends,with protective covers on each corner of the case and lid, was used for soiled nurse uniforms and taken to the Royal Melbourne Hospital Linen Service. The cases were returned to the nurse with laundered uniforms, Each nurse was allocated her own numbered case.This service commenced c 1953 until April 1992.Nurses then supplied and laundered their own uniform and the hospital laundry contact moved to Warrigal Linen Service. All nursing staff during this period had their uniforms laundered in this way. Uniforms suppied by Alfred Hospital to nurses were conpulsory. The significance of the laundry case shows how times have changed for nursing staff in that uniforms, if worn, are laundered by the staff themselves. Sticker stating Royal Melbourne Hospital Central Linen Service and on outside number of box E 171 for identification purposes. This iron sundial and plaque was donated by family and friends of Sister E.M. Rutherford in 1953 ,an Alfred Hospital Nurse who graduated 1935, in her memory as she died on Hospital Ship Centaur in WW11. Many Alfred Hospital nurses have served in wars. Some were killed. The significance of the sundial and plaque is that it reminds us of the many Alfred Hospital nurses willing to serve their country. 'Be as true to each other as the dial is to the sun'. Roman numerals, month and minutes. Rectangular plastic DVD box with DVD included.The DVD which runs for 1 hour has interviews,film and photos detailing the service of 19 AH nurses in Bien Hoa during the Vietnam War in the 1960s. Yellow colouring on cover with photgraph of two Alfred Hospital Nurses with Vietnamese children. This DVD, years in the making, tells the story of nineteen nurses from The Alfred Hospital who bravely volunteered to work in the heat and the turmoil of the Vietnam War. The Bien Hoa Provincal Hospital was in a very active military zone and the nurses quickly discovered how unprepared they were for what lay ahead. 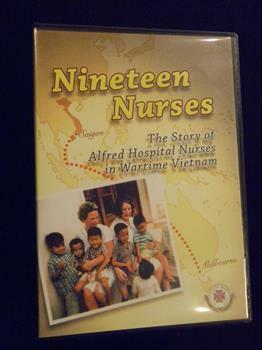 The cover of the DVD has the inscription "Nineteen Nurses The Story of Alfred Hospital Nurses in Wartime Vietnam" The back side of the DVD box has a synopsis of the nurses time in Vietnam and quotes from 2 AH nurses.Produced by Educational Resource Centre of The Royal Children's Hospital Melbourne for the Alfred Hospital Nurses League. A photograph of Matron Louisa Mann and nursing staff taken in 1922 at the Alfred Hospital. Many photographs were taken of Matron Mann & Staff in 1922. It was described as a 'progressive year' in relation to building expansion. The Linay Pavilion was renovated and remodeled; concrete modern covered ways connecting Wards and the operating theatre had been completed; and the new home for nurses had been opened & a covered way constructed from the nurses quarters to main buildings. There were also renovations to portions of the Administration Block. Many photographs of the Matron and Staff were published in 1922 with the new buildings in the background .For example, the construction of Nurses Home was the completion of the scheme inaugurated in 1908 when night nurses' quarters were erected. The new building contained 124 rooms, in addition to pantries, box rooms and all necessary offices. A larger nurses home secured accommodation for more nurses to be trained. 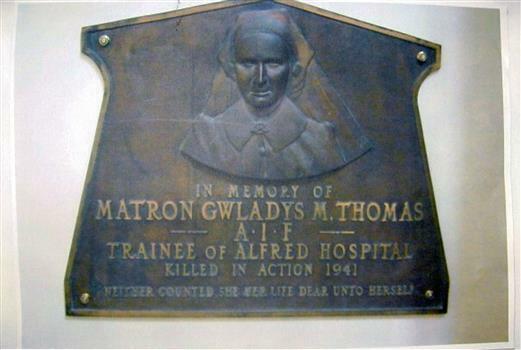 This large metal plaque made from metal and brass is to the memory of Matron G. M. Thomas, Alfred Hospital Graduate 1933,was Matron of Hamilton Hospital and was killed in action in 1941.The plaque contains a 3D image of G. m Thomas wearing her Alfred Hospital Nurses League badge. Matron Thomas was already in the army reserve at the outbreak of WW11, saw action in Middle East, unfortunately killed in a car accident after evacuating patients at this time. The memorial plaque is significant because Matron Thomas was an Alfred Hospital graduate and remembered by the Alfred Nurses League and Alfred hospital. Syringe and Needle Kit for Visiting Nurses circa 1900. 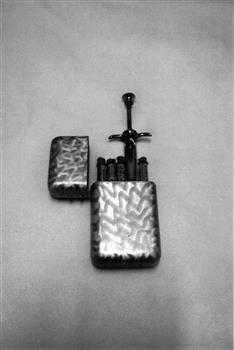 Silver coloured metal flip up case containing a glass and metal syringe. A small glass vial containing 6 hypodermic needles. A further 6 vials with cork stoppers containing analgesic tablets to be dissolved in sterile water prior to administration. There are 2 perished rubber washers used in the syringe and a wire stilette for needle cleaning. Used by visiting trained nurses from The Alfred Hospital to administer medication in the patients home. 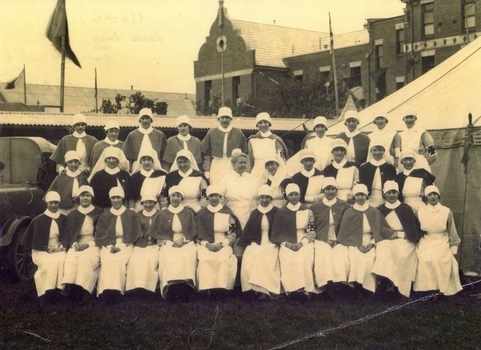 The Alfred could provide these trained nurses as the Alfred began training nurses from 1880. The first training school in Victoria. A small, reddish brown, leather covered pocket sized book. Gold lettering on front cover. 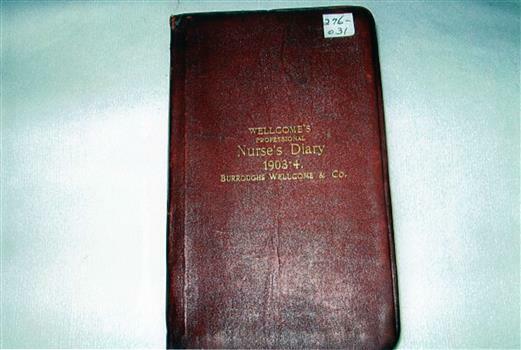 The diary was used as a note book for Nurse Lectures in 1888. It mentions the subjects taught to nurses and by whom. 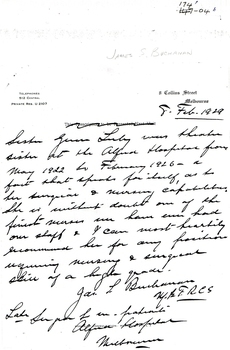 The 1888 diary is significant as nurse training commenced at Alfred Hospital in 1880. 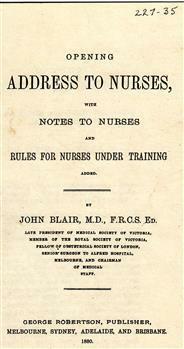 The first general nurse training school in Victoria , so the contents of the book indicate what was being taught and by whom. A sepia photograph of the Childrens Ward at Alfred Hospital circa 1910. A sample of a light airy ward. The Children's Ward at Alfred Hospital called the 'Michaelis Ward' was opened in February 1902. A light airy ward. The Michaelis family were Alfred Hospital benefactors. 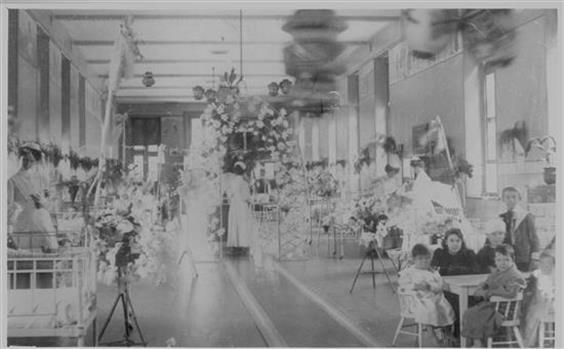 The photograph is of significance as it depicts a light airy ward.When cerebrospinal meningitis outbreak occurred in military camps in 1915 the childrens ward was used for extra and extensive care. These three arm badge patches are made of fabric. They represent the seniority of the student nurse during her training at the Alfred Hospital. These badges were sown onto the outer left sleeve of the uniform after the nurse passed each phase of training. Worn on a uniform sleeve between 1950 and 1992. The student nurse arm badge patches were introduced in the 1950's to identify the seniority of the nurse during the 3 years of training. The first year nurse wore a white maltese/pattee cross patch on a light blue square;the second year nurse wore a red skeletal cross on a white square and the third year nurse a filled in red cross on a white square. Prior to the 1950's the nurses from 1880 were identified by only two arm patches. A red skeletal cross and a filled in red cross which were on arm bands and were pushed up and positioned over the left sleeve. These arm badge patches are significant to nurses who trained at Alfred Hospital as they remind them of the different phases of their three years of nurse training. A blue leather bound certificate which folds open to reveal coloured calligraphy describing a 'thank you' to an esteemed auxiliary committee member in 1937. This certificate was presented to Mrs Lucie Hallenstein who was a prominent auxiliary member 1920-1937. The certificate is significant as it was donated by Mrs Hallensteins granddaughter who trained and nursed at the Alfred Hospital and her great granddaughter also nursed here. Front cover: Alfred Hospital Service & Care Incorporated Melbourne & logo. Mrs R. Hallenstein OBE . 1937. Inside: Detail of the 'Thank you'. This photo shows a group of student nurses who are practicing bandaging in the sunshine near their practical classroom in 1933. Two tutor sisters are teaching them. They are wearing veils and their uniforms have become slightly shorter in length during the 1930's. It was very important for nurses to practice bandaging during their nurse training , as the application of a comfortable and supportive bandage to a patient was indicative of skilled, high grade training. 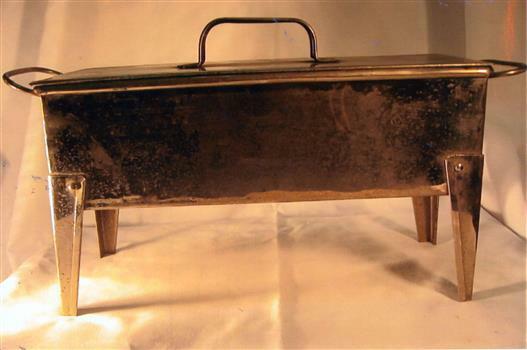 This item was used in hospitals during the 1950's to assist feeding old and frail patients, unable to feed themselves or to sit up in bed. The spout prevented spillage of such liquids and beef tea, cocoa & warm milk. This item was used in the 1950's and has now been replaced by plastic cuos with lid and small spout. The stamp on the top of the cup is Victorian Hospital Association. 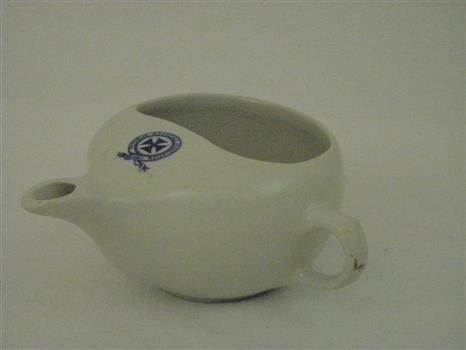 This was the major supplier of all medical and food items to public hospitals in the 1950's. On under side in blue ink "STEELITE /GLOBE POTTERY Co Ltd /ENGLAND SUPPLIED BY/ J. DYSON & SON MELBOURNE"
This small round medal has been inscribed with the name of nurse Annie Rentle to whom it was awarded. 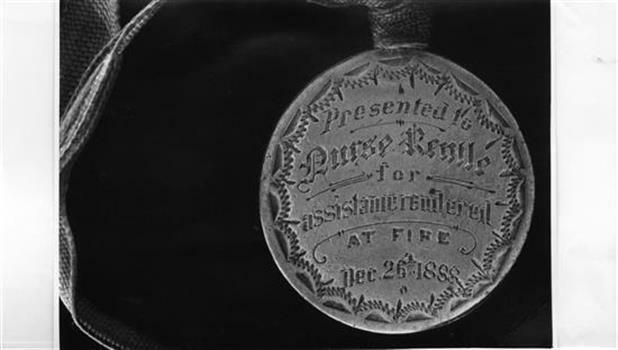 This medal is significant as it is evidence of the appreciation by the hospital by the heroic efforts of the student nurse to ensure the safety of patients during this fire. 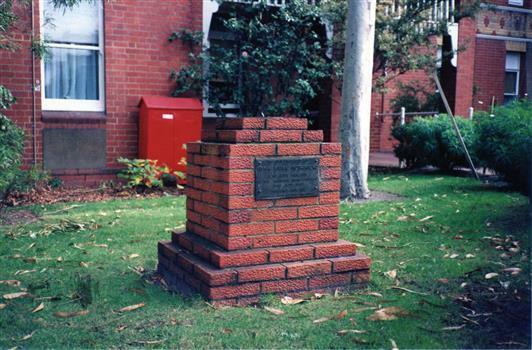 The Alfred Hospital was the first nurse training school for general nurses in Victoria. The first lecture was 1st December 1880 by Dr. John Blair. He created this booklet and included an examination. This booklet if significant as it shows the preparation required to ensure quality nurse training from 1880 at the Alfred Hospital. This crest and motto was used at the Alfred Hospital between 1895 and 1936. But, the motto was introduced in 1880 when the hospital introduced a nurse training program. This crest and motto was designed at the Alfred Hospital in 1895 and used until 1936.It featured a red pattee cross set above a motto which was introduced when the Alfred Hospital began nurse training in 1880. The motto is significant to the Alfred Hospital Nurses League Inc. established 18th October 1918. There was no hospital badge for nurses on graduation from the Alfred Hospital, so the Alfred Hospital Nurses League Inc. had a badge designed with the hospital crest and motto which the League presented to Alfred Hospital nurses graduating from 1920 onwards.Reference: Alfred Hospital Nurses League minute books, 1919-1920. A crest was designed consisting of a red pattee cross set above the words ," Where there is not a women, there the sick man groaneth"
An open wooden frame supported by six small horizontal beams. At the top of the frame is a metal shaft and handle which holds a bandage. The frame is on a wooden stand. Circa 1905-1933.The bandage winding machine manually wound calico bandages for patient use. A sheet of calico was torn into strips of differing widths. The length was around 8 feet or 240 cm. The bandage was wound around the handle shaft by hand initially to get purchase. Then the handle was turned until the bandage was tightly wound. Each bandage could be reused, after it was washed, dried and rewound on the machine. 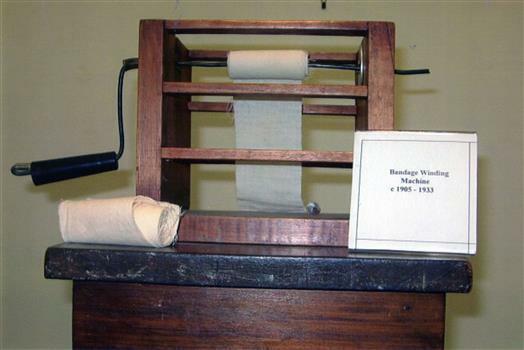 The bandage winding machine enabled a more effective use of a bandage on a patient, as the machine wound it more tightly than a hand rolled bandage thus allowing more effective bandaging. Under the wooden stand is written: Tutorial Dept. Alfred Hospital. The first grass tennis courts were built in 1923 between the Edward Wilson Wing[ Wards 3 & 5] and the nurses home, close to Commercial Road. This photograph was taken in 1933. In 1943 the Margaret Coles Maternity Wing opened on this site. The tennis courts were relocated to the other side of the walkway until 1993 when the multi story car park occupied the site. 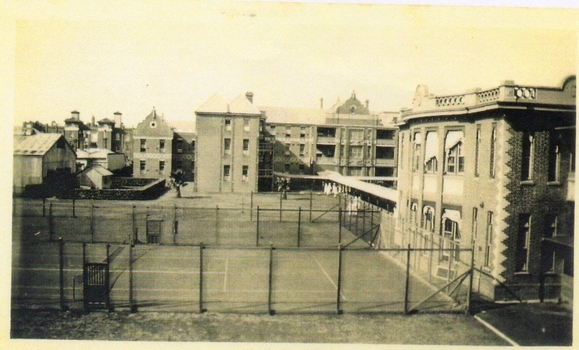 This is a photograph of the first grass tennis courts at the Alfred Hospital. They were built in 1923. The photo was taken in 1933.Many social tennis matches were held during the 70 years they were on the Alfred Hospital site. The tennis courts were being considered in 1900. They were not established until 1923 and there are many photographs and stories to justify how extensively they were used. They were relocated in 1943 and used until a multi story car park was built on the site in 1993. The photo is from a donation album which contains other photographs of the tennis courts. This commemorative plaque was created to mark the 100 years of the Alfred Hospital School of Nursing since Dec. 1880. 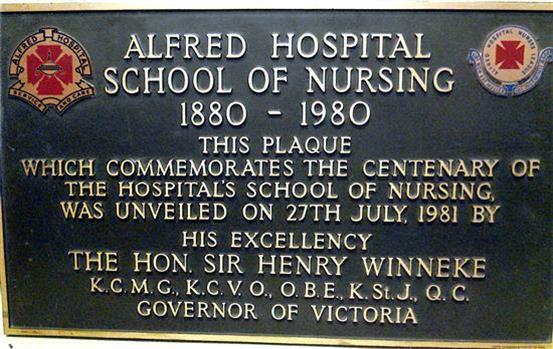 The plaque is significant as the Alfred Hospital School of nursing was the first formal , general nurse training school in Melbourne. As above unveiled by Governor of Victoria Hon. Sir Henry Winneke. Badge of A.H. Badge of A.H.N.L. 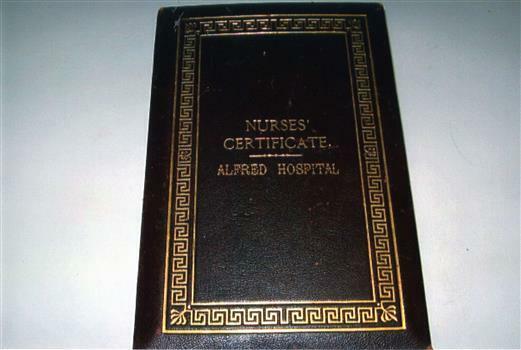 This work reference for Nurse Luly is an example of the value placed on highly skilled nurses, who trained at the Alfred Hospital in the 1920's..
A highly skilled surgical nurse is highly sought after. To receive a work reference from a prominent surgeon would ensure the nurse could have the type of surgical work she liked, to provide work satisfaction and allow her to travel if she chose. 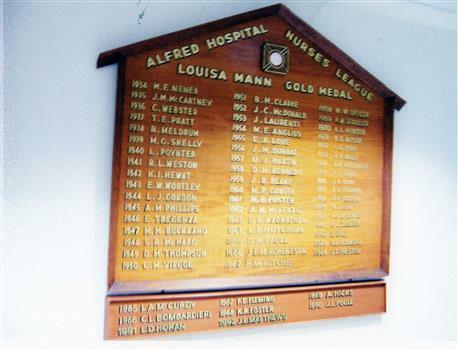 This honour board, made of timber, lists the names of 59 nurses who were awarded at an annual event , the Louisa Mann Gold Medal to the most outstanding nurse in three years of training [theory and practice]. This timber honour board was created in the 1930's and the name of the first nurse was added in 1934. The name of the last nurse was 1992 as the School of Nursing at Alfred Hospital closed. This honour board is significant to all nurses who graduated from Alfred Hospital as it was a privilege to be nominated the nurse with best over all performance during the groups 3 years of training. A photograph taken circa 1948, of two trainee 2nd year nurses, caring for children in the sunshine outside the Children's Ward 15. 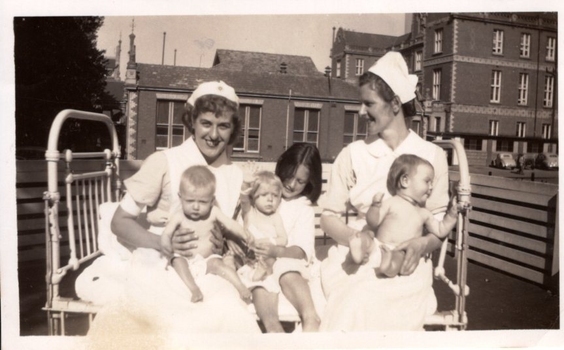 This photograph of two Alfred Hospital trainee nurses with children indicates how important it was to allow children in hospital some exposure to sunshine and fresh air. The Children's Ward 15 at the Alfred Hospital was on the ground floor and opened in 1902, west of the Administration Block. The upper level was Ward 12, a women's Medical Ward. A feature of this wing is that it had verandahs and balconies on both sides, these being equipped with a special design of blind. Patients could benefit by the morning as well as the afternoon sunshine. Nurse Graduation Certificate 1888, Alfred Hospital. Hard cover, brown leather with gold lettering title and decorative border on the front cover. When folded open there is a print of Alfred Hospital on the upper half and a certificate on the lower half. The first nurse graduation certificate was given to Alfred Nurses in 1882. The School of nursing commenced at Alfred Hospital in 1880. It is the first general nurse training school in Victoria. 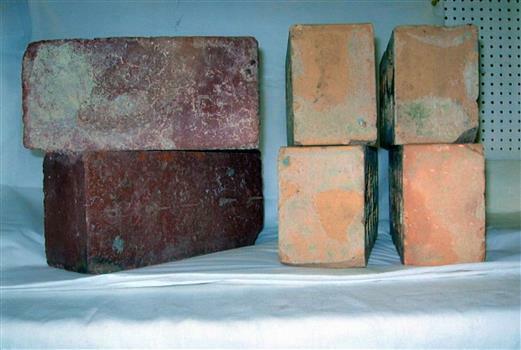 These six bricks were saved from the Alfred Hospital Nurses Home when it was being demolished in 1996. The nurses who saved the bricks had difficulty accessing the site and this effort is now appreciated by nurses who return for reunion tours of the hospital and reminiscense about the nurses home. These bricks evoke many memories of the nurse training days, prior to 1992, when nurses were encouraged to live on site at the nurses home. These items are of significance because we have memories of the building so many of us called home during our nurse training.